Hidden Inn Gosho is a charming family friendly two bedroom townhouse in a central location near the Imperial Palace. I fell in love with this lovely old house and the charming historical neighborhood the first time I saw it. Now that it has been lovingly restored I am happy to be able to share this charming space with you. 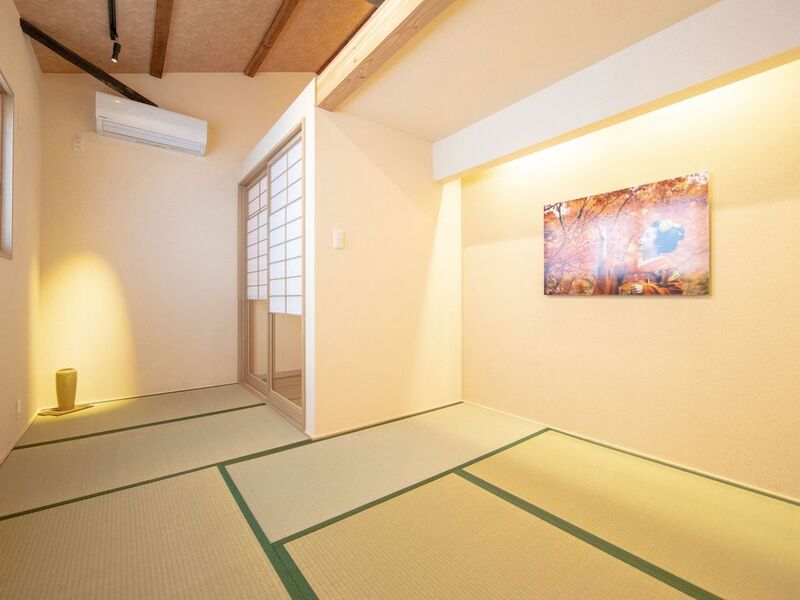 The townhouse has been renovated to provide a balance between traditional Japanese style and modern amenities. Visitors can experience what it's truly like to live like a local. The bedrooms have tatami mats and futons which are surprisingly comfy after a long day of exploring. The fully equipped kitchen and dining area mean making meals in is also a breeze. There is a washer dryer for your laundry and a super comfy sofa to cuddle up and watch TV in case of rain. My family were very lucky to have been able to stay at Hidden Inn. This house is in a very central location, west of the imperial palace gardens. It is a very nice neighborhood and we found it easy to get around and explore. There are interesting points in every direction from this house, many reachable by foot. It was a lot of fun exploring this charming old city. The nearby Star Cafe and Morpho Cafe were great spots for a quick bite and there were several interesting restaurants and bars just across Horikawa street. Unfortunately we were not here at the right time to see the market at Kitano Tenmangu shrine, but we would like to return for this next time. I spent 3 nights in this amazing new property with a family of 4. It was the perfect size for us and we really enjoyed our stay. The house has everything a traveler needs which made it very easy to relax. It was my first time staying in this area of Kyoto and I had a lot of fun exploring the central and west parts of the city. Its an amazing neighborhood with lots of opportunities to explore. It was nice to be away from the incredible crowds around Kyoto station and Gion but also be able to get to those places quickly and easily when we needed to. I highly recommend this place as well as the host. We look forward to returning. Thanks very much for the kind review. It truly was a pleasure hosting you again. I am glad that you enjoyed this house too. Please come again soon! Keith was a wonderful host. Very quick to respond to queries and to provide necessities in the house. The house itself is beautifully designed and practical. Very comfortable for my family of 4. It is a little west of the imperial palace gardens, but is just a 3 minute walk to the bus, from where you can take buses to just about every tourist destination. There is a convenience store, bakery, cafes and small supermarket nearby and Nishijin area is a 10 minute walk away. Would love to stay here again next time I'm in Kyoto.